In the sixteen years I’ve been writing, I think this is my all-time favorite piece. I’m just the messenger, the fortunate writer who heard about this from my sister, Cindy. She witnessed this event at her son’s Little League game back in 1999. 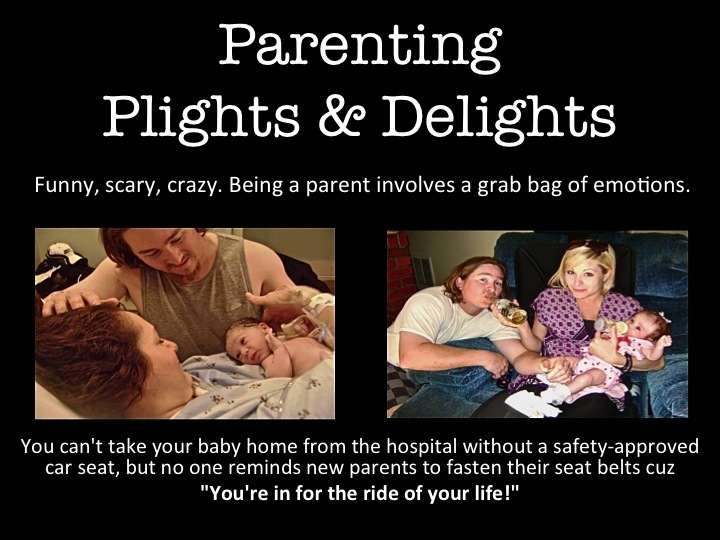 At that time, I wrote a weekly parenting column for the Highland Community News. Thankfully, I saved the clip. Read on if you need a shot of inspiration. Back in 1999, Maureen Lambert, a mother of two, was being treated for breast cancer. One Saturday she was feeling particularly tired due to her chemotherapy. Ten-year-old Justin wanted to know if she was coming to his Little League game. He’d been wanting to hit a home run in her honor all season, but it hadn’t happened yet. 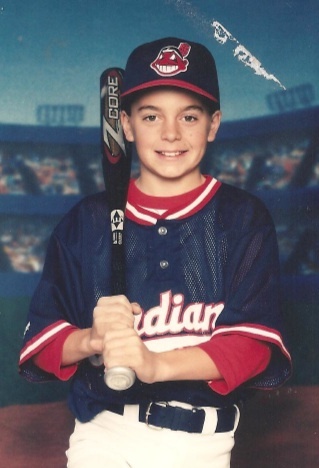 “I feel a home run coming today,” little Justin said. Despite her illness, Maureen hadn’t missed a game all season. So she pulled herself together as fast as she could and got six-year-old Kaitlyn ready, too. By the time Maureen and Kaitlyn arrived at the ballpark, the game had already started. Some of the fathers rushed over to Maureen and announced that Justin had just hit a home run. And little Justin did just that. He hit a second home run for his mom, but this time it went over the fence. Not only was Maureen overwhelmed with excitement, the crowd exploded with cheers and applause. There were many moist eyes at the Little League field that day. At the end-of-season party, the team awarded Maureen a plaque of courage because she was a prime example of what courage is all about. Like I said, that was back in 1999. I found the newspaper clip in mid-September, but before posting it on my blog, I wanted to follow up on how Maureen is doing these days. I called my sis and learned Maureen has been cancer free all these years and was getting ready to run in a marathon that weekend with little Justin, who is now big Justin, to raise funds for a cure for breast cancer. At the time, I didn’t realize October is Breast Cancer Awareness Month. What a coincidence. Not! I believe there’s more than mere coincidence at work here. September 23, 2012, Newport Beach, California. Please join me in cheering for Team Moe for many more years of being cancer free, running marathons, and inspiring hope and courage in others. Do you have a hero like Maureen or Justin who has inspired you? This story made me cry happy tears. Did it affect you the same way? I’m guest posting on Fabio Bueno’s blog today for his YAmondAY series. I hope you’ll stop over. Click here. You’re invited to my party! I’m launching my chapter book Curse of the Double Digits, for ages 7 to 10, this Wednesday, October 10th. Becky, the main character, is turning ten on the 10th day of the 10th month! Please come celebrate Becky’s birthday and the debut of my chapter book. Be sure to enter the giveaway by leaving a comment. I’m giving away ten copies of Curse of the Double Digits – five signed paperbacks and five eBooks. If you’re not a parent, memories from your own childhood count, too. you can reach me at: lynkelwoohoo at yahoo dot com. 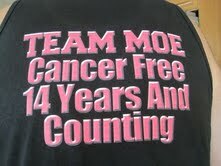 This entry was posted in Uncategorized and tagged marathon fundraiser, mothers with cancer, Run for the Cure, Team Moe. Bookmark the permalink. Not that is a great story – and with a happy ending! What a sweet story – thanks for sharing! And congrats on the upcoming release!!! Alex – Thank you. I think it's a pretty inspiring story.Jennette – Thank you, Jennette. Go, Moe! I love this story, and I'm so happy to hear that Moe and Justin are doing well. What a sweet story. I'm glad it has a happy ending 14 years and counting. Old Kitty – Yes, a very brave mum. And an awesome son. Thank you!Robyn – Yes, the smiles tell it all! I feel the same way. Thank you! Saving you a spot for first in line for the bounce house!Piper – Thanks for stopping by. Yes, I'm so happy Maureen is doing so well. Yay! Team Moe!Theresa – Thank you. I think we all love a happy ending.Patricia – I'm so sorry you lost your mother to the cancer monster. It is a monster, and I hate it. My mother is a survivor. I think 8 years now. I know too many people who didn't beat it, though, so I guess that's why this story makes me cry each time I read it. Take care. Great story…with a happy ending. Thanks for sharing it with us. I was bracing myself for the worst when I got to the part where you were going to check on Maureen's status and was thrilled and delighted to see that she's cancer-free and doing so well! Warmed my heart!If I don't flake out, I'll be at your launch party tomorrow! 🙂 Congratulations again!! Sharon – Thank you. Happy endings are so nice!Jess – I love to hear about cancer survivors, too. It gives us hope. Yes, stop by for the launch Wed. and enter the giveaway! Thanks, Jess.Crystal – I'm happy your brother is a cancer survivor. Three years old? It's hard to imagine getting cancer so young. Yes, your brother and mom are both troopers.Teresa – I'm glad it warmed your heart. This story warms my heart, too. Hope to see you at the launch tomorrow! What a heartwarming story, Lynn! I am so glad to hear Maureen is doing well!